A NAND gate is a combination of an AND gate and NOT gate. 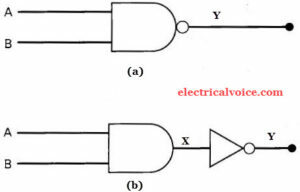 If we connect the output of AND gate to the input of a NOT gate, the gate so obtained is known as NAND gate. This gate is also called as Negated AND gate. In Boolean expression, the NAND gate is expressed as and is being read as “A and B negated” or “A and B bar”. The logic symbol of NAND gate is shown in figure 1(a). Figure 1(b) shows the NAND gate as the combination of AND gate and NOT gate. The NAND gate truth table for figure 1(a) is shown below. The NAND gate truth table for figure 1(b) is shown below. From NAND gate truth table, it can be concluded that the output will be logical 0 or low when all inputs are at logical 1 or high. The repeated use of the NAND gate can produce all other logic gates. Thus in digital circuits, it serves as a building block. If the two inputs of the NAND gate are joined to make one input as shown in figure 2 below then the NAND gate functions as a NOT gate. In the truth table of NAND gate, if we use B = A, we obtain the truth table of NOT gate. To produce OR gate using NAND gate, the inputs A and B of the two NOT gates (obtained from the NAND gates) are joined together. The inputs A and B will get inverted. These outputs are then fed as inputs to the NAND gate as shown in fig. 3. Q. Why are the NAND gates called as a digital building block? Answer. The repeated use of NAND gates can produce all the three basic gates i.e. OR, AND, and NOT gates; whose various combinations provide us large number of complicated digital circuits. Hence in digital circuits, NAND gate is called as a digital building block. Q. What do you mean by the truth table of a logic gate? Answer. It is table which shows all the input/output possibilities for a logic gate. Q. Name the types in which the electronic circuits have been classified. Answer. The electronic circuits can be classified as (a) analog circuits and (b) digital circuits.